Apologies for the absence last week, but the Friday Styleflash is back again! 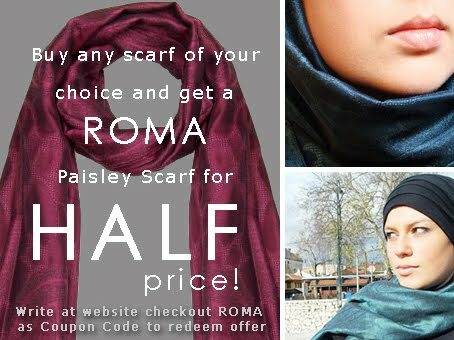 Bellissima Scarves are offering a Roma Paisley scarf for half price, when you buy any scarf of your choice. Enter the code ROMA at the checkout. Haute Hijab have a sale on with upto 40% off their clothing! Aab have lots of new arrivals including abayas and printed hijabs. And in case you missed the previous post, Zeena have recently launched their Eid clothing collection.